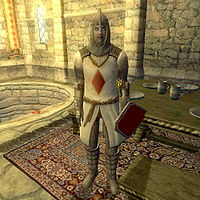 The Knights of the Nine are generic replacements that appear if one of the named knights dies after the final quest. If a named knight dies before, one of these knights will replace them when they all gather around to hear Sir Thedret's speech. They all wear a set of chainmail armor except for a Knights of the Nine Cuirass and Knights of the Nine Shield. They are armed with a leveled longsword and bow (up to Ebony quality) and silver arrows. If killed, they respawn at the Priory of the Nine after three days. 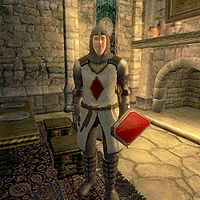 As with the named knights, the generic replacements can be ordered to "Come with me", and will then follow the player indefinitely. While following, they can be given a few simple orders. "Wait here" causes the knight to pause at their current location until given the order "Follow me". 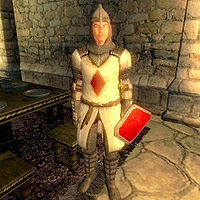 They can also be ordered to "Return to your duties", which causes the knight to return to the Priory of the Nine. 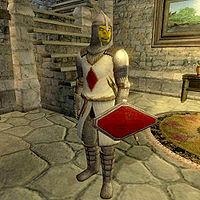 This Redguard knight replaces Sir Avita. He wears a set of light armor, consisting of; chainmail boots, gauntlets, greaves, and helmet with a Knight of the Nine cuirass. In combat he wields a Knights of the Nine shield and a leveled longsword or bow with silver arrows. This knight also may wear tan linens, a forester's shirt, and a pair of pigskin shoes. He carries a moderate amount of gold. 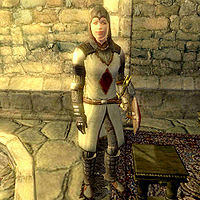 This Knight does not sleep, he just wanders around the bottom level of the priory for the night. This Nord knight replaces Sir Areldur. He wears a set of light armor, consisting of; chainmail boots, gauntlets, greaves, and helmet with a Knight of the Nine cuirass. 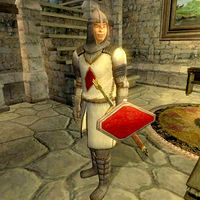 In combat he wields a Knights of the Nine shield and a leveled longsword or bow with silver arrows. 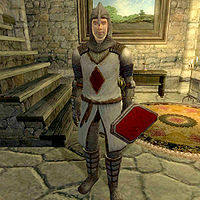 This knight also may wear a pair of pigskin shoes, and leveled middle class shirt and pants. He carries a moderate amount of gold. This Imperial knight replaces Sir Thedret. This Imperial knight replaces Sir Carodus. This Imperial knight replaces Sir Geimund. This Orc knight replaces Sir Gukimir. This Dunmer knight replaces Sir Lathon. 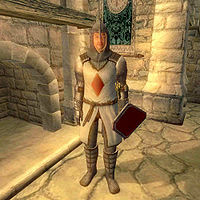 This Nord knight replaces Sir Brellin. The sleeping bug for four of the knights is caused by an error in their AI. They all have a sleep package, but it only runs if the knight is not in the Knights of the Nine faction, which is never true. The other four knights have a second AI package that works correctly, causing them all to sleep from midnight to 9am.